According to the Daily Mail, Manchester United have identified Barcelona defender, Samuel Umtiti as the defender the club wants to take us to the next level. Despite boasting the best defence in the division at the moment, Jose Mourinho is believed to be keen on the France international who has been an ever present for the Catalan outfit since his move to Camp Nou from Lyon last summer. The central defender has slotted into the heart of the defence of the La Liga league leaders with Gérard Pique, thereby dislodging the veteran Javier Mascherano from the side. Manchester United signed Sweden centre back, Victor Lindelof in a bid to add more quality to the backline, however the move has been nothing short of catastrophic. He has made an error strewn start for the club and it seems that Jose is losing patience with the 23 year old defender. In contrast, Umtiti has helped Barcelona rise to the top of the Spanish league standings, as he has been an ever present for the 5-time European champions. The Daily Mail also reports that the French man’s release clause is set at £53m, which in the world of football, is fair price for a top class central defender. José wants more quality players in a bid to compete with bitter rivals, Manchester City who are looking good for the title already. The Portuguese manager has been criticised for being negative in the matches against Liverpool and Chelsea, that has seen us fall eight points behind City – a feat the bookmakers and most sports betting online users never predicted despite matching them at the early part of the campaign – and José knows that a player of Umtiti’s quality will add more solidity and calmness to his defence when the business end of the season comes calling. Lindelof is yet to start a league match this season, with his highlight coming in the 2-1 loss to Huddersfield, where United conceded twice in 10 minutes after coming on, with the former Benfica man culpable for both goals. 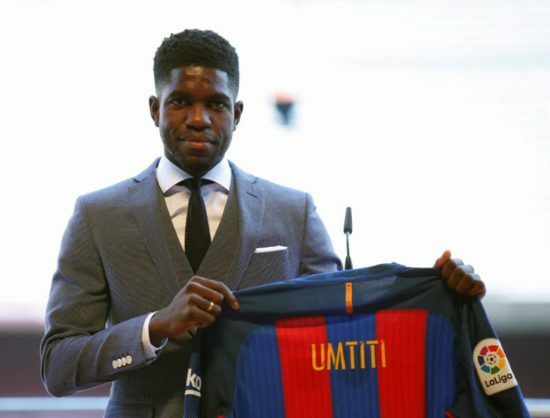 Umtiti is a ball playing, left footed defender known for his calmness in possession, tackling and interception skills and his positional discipline. He joined Barcelona for £21m in 2016 and has made 58 appearances for the Spanish giants.